Most whiplash injuries occur as a result of getting hit from behind while driving, also known as getting rear-ended. As a matter of law, if another driver hit you from behind, the other driver is usually going to be primarily at fault. In some cases, the courts or insurance companies will conclude they are totally at fault. Either way, you’re probably going to get something from the other driver’s insurance company to pay for any damages and injuries you suffered. What you actually get depends on the extent of your injuries, such as whether you suffered whiplash. Whiplash is the common term for soft tissue injuries to the neck; it is not an official or scientific medical diagnosis. Whiplash occurs when your head whips back and forth very quickly as a result of a car accident. This commonly occurs in a rear-end collision because your head is usually not resting against your headrest when you get hit from behind by another vehicle. Symptoms of whiplash usually include back and neck pain, with muscle stiffness, headache and trouble sleeping. Why Is Whiplash Such an Issue? 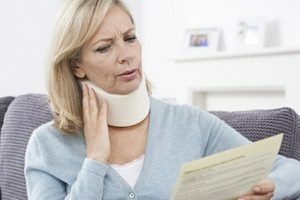 I know what you’re thinking: if it’s clear that the other driver was at fault when I received my whiplash injury and my injuries are obvious, why is there even a question of whether I’ll receive a whiplash compensation settlement? That’s because whiplash injuries are hard to prove and even harder to quantify. In other words, how do you objectively prove you’re feeling pain? How much compensation should you receive as a result of that pain? These are the two questions that make a whiplash compensation settlement tough to get. Unlike a broken bone or a torn tendon, it is difficult for medical tests to prove whiplash injuries. Sometimes there are signs of sprains and strains, but there’s no break or tear in the tissue. Instead, the other driver will dispute that the evidence of sprains and strains are enough evidence to warrant a settlement. The other side will argue that strains and sprains often go away on their own or they could have been present before the crash. This is why whiplash settlements are less common than you might think or are for a smaller amount than you might expect. It’s an injury that’s hard to convince the other side you truly have. Think You Have a Whiplash Injury? If you believe you may be eligible for a whiplash compensation settlement or were otherwise the victim of a car accident, contact Williams & Williams, LLC online to discuss the legal options you have available and what your next course of action should be.